The Australian Bureau of Statistics (ABS) released building approvals data for December 2013 earlier this week. A quick summary of the statistics is provided below. The number of dwelling approvals fell by -2.9% in December 2013 with private sector house approvals falling -3.4% and private sector unit approvals -1.2%. Despite the monthly fall, year-on-year there has been a sharp rise in dwelling approvals. Approvals are 21.8% higher year-on-year with private sector house approvals 17.8% higher and private sector unit approvals increasing by 29.3%. Over the month home values rose across each capital city except for Adelaide where they were unchanged and Perth and Darwin where they fell. Over the past 12 months, home values fell in Hobart but rose in each other city ranging from a 2.5% increase in Adelaide to a 13.4% increase in Sydney. The Reserve Bank’s (RBA) Board held their first meeting on Monetary Policy earlier this week. At the meeting, official interest rates were kept on hold at 2.5% it was the sixth month in a row that no change to the cash rate had been made. The minutes note the further pick-up taking place in home values however, the final two sentences are probably the most pertinent. These sentences indicate that the tightening bias for interest rates has been removed for the time being. For the first auction week of 2014 there were 457 total auctions across the combined capital cities. The weighted average auction clearance rate was recorded at 64.3%. The auction clearance rate was slightly higher than the 62.7% recorded during the final auction week of last year however; the number of properties taken to auction was significantly lower than the 1,332 last year. Across Australia’s largest auction market, Melbourne, there were 104 auctions last week down from 531 at the end of 2013. The auction clearance rate was recorded at 74.7% last week which was an increase from 66.2% at the end of 2013. Sydney had 121 auctions last week and an auction clearance rate of 75.0%. The number of auctions was much lower than the 532 auctions at the end of 2013 however; the clearance rate was much higher than the 68.5% at that time. 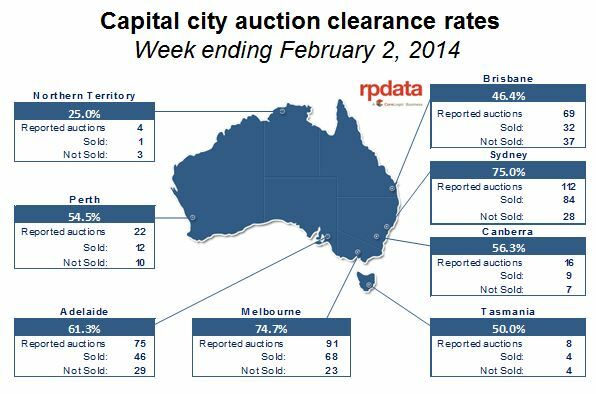 RP Data is currently tracking 900 capital city auctions over the current week. Over the four weeks to 2 February, there were 38,695 newly advertised properties listed for sale nationally. 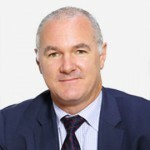 The number of newly advertised property listings increased by 25.5% over the week as market participants move out of the festive season slow down. Despite the steep rise, new listings are currently -0.1% lower than at the same time last year. Across the combined capital cities, new listings were 32.6% higher over the week and they were 2.2% higher than they were a year ago. There are currently 236,500 properties listed for sale across the country. Total listings at a national level were 1.9% higher over the week but -4.3% lower than they were at the same time last year. Across the combined capital cities, total listings have increased by 3.5% over the week and they are -12.0% lower than they were at this time a year ago. Capital city listings account for just 40% of all listings nationally.